I’m always surprised when people say that they don’t have time to cook. I mean, aside from reproducing, physiologically, we don’t really exist on this earth for any other reason. (Unless someone knows something that they’re not telling me.) Feeding ourselves is really our most basic human need. Now if someone said, “I don’t have time to clean up afterward”, then I can totally relate. I spend at least 40% of my life standing in front of a sink, washing dishes. When people ask if they can come and help me test recipes, I always say, “Bring rubber gloves!” And that’s the last I hear from them. This is one of my very favorite go-to dinners. It’s incredibly easy and there are hardly any dishes to wash; just toss chicken pieces in olive oil, vinegar, soy sauce, and shallots in a baking dish. Season with salt and pepper, and pop it in the oven. During that time, the shallots get crispy-sweet and caramelized, and since it only takes about 45 minutes to bake, you have time to mix yourself a Sidecar. 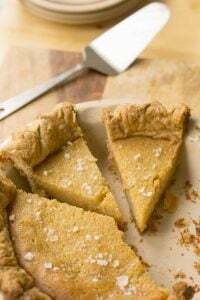 This recipe is adapted from French Farmhouse Cookbook, by Susan Loomis, a friend who teaches cooking classes in France and designs dinners online at notakeout.com. If you buy the chicken cut up, it’s super-simple, and the only work really is mincing four shallots. Luckily here in France, there’s lots of volaillers at the markets that will cut up a chicken for you in no time, and it’s included in the price, service compris. And if you go to the volailler, always, always listen to them. I once was planning on making coq au vin and saw a large rooster in the display case, about the size of a basketball, and told him I wanted it. “L’entier?” he asked. And of course, I said “Oui, Monsieur“, I wanted the whole thing. Thankfully he talked me into only buying half of it, because when I got home and unwrapped the parcel, there must’ve been about forty eight pieces of chicken in there. To the recipe, I added a bit of soy sauce, which is one of the secret ingredients in many dishes, even in French cooking. At a restaurant in Lyon that was widely renown for their ‘secret’ salad dressing, I ate there with a chef friend. And the first thing he said after he tasted it?—Soy sauce. So I added a bit to the sauce, which gives this dish a savory-salty umami taste—which in French, I believe, is called je ne sais quoi. Feel free to change around what vinegar to use. Balsamic would not be sharp enough, and too sweet, but apple cider vinegar would likely be nice, as would be sherry vinegar, which is my vinegar of choice for vinaigrette. But you can do whatever you want. After all, you’re the one eating it. Aside from its utter simplicity, the other great thing about this dish is that aside from the chicken, you can make it from ingredients you probably already have in your pantry. And if you don’t keep shallots around, you should. Because once you taste it, you’ll want to be able to make this at a moment’s notice, as I often do. Adapted from French Farmhouse Cookbook (Workman) by Susan Herrmann LoomisI use a whole chicken cut into eight pieces; two legs, two thighs, and I cut each breast piece in half, crosswise, keeping the wings attached. You could also just use eight of your favorite chicken pieces. Hmm, sounds tasty. Sometimes I make a similar one, with bacon, garlic and cheese under the skin. Ah soy sauce, the saviour of so many dishes. Mind you, here in England, one would nearly as often use marmite. I do probably 90% of the cooking. My husband does about 90% of the washing up, including loading and unloading the dishwasher (which besides washing your dishes for you is a fantastic hiding place for dirty dishes!). Works for me. You’re right – this sounds just too easy not to make (and too delicious!). Love the addition of soy sauce. 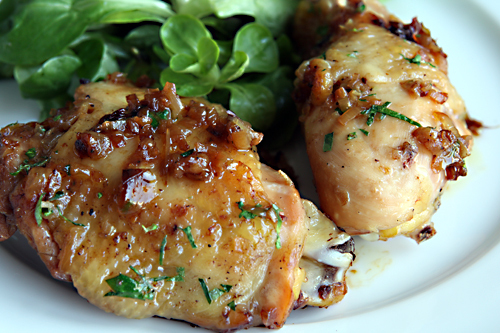 roasted chicken with shallots is one of my favorite meat recipes. It’s so easy to make and always tasteful. I love to add some grenailles potatoes in the pan, and serve this with green peas. before baking the chicken pieces and even before coating them with the sauce, I advise to put them at the end of a big fork, one by one, and to get them trough the fire of la gazinière, well licked by the flames of the stove. It burns whatever feathers would have been left and dries out the skin humidity for wonderfully crispy results at the end of the time in the oven. My grand-grand-mother gave my mother this trick and I must say it never fails :). Eelco: In France, there’s a piece of turkey called sot l’y laisse which roughly means, “The part the idiot leaves behind”. It’s a very flavorful part of the turkey (although to me, it tastes a bit too-gamey…and I like game a lot), but it’s interesting that they name it that. But if you do have a flame, or feel like searing them in a pan, it does give roast chicken that extra je ne sais pas! Why do you finish roasting the chicken skin side down? I love this idea because each time I try to caramelize shallots in a skillet, they end up getting crispy. Not that I am complaining – those are wonderful, too! This looks great! We both love shallots, but don’t eat them nearly enough. I bet they give the chicken a great flavor here. And I hear ya on cleanup. Dishes are the bane of my existence. Looks delicious: and its only 9am so I wouldn’t have thought i’d be drooling over chicken! I love the low dishwashing requirement: if recipes used a symbol to designate the amount of time I’d be standing at the sink, I’d pick a 1 dish meal over a four disher any day! Oooh! I just found that the Indian grocer near my house carries shallots, and so I have some on hand for the first time in years. Now I know what I will be doing with them. I use a bit of soy on the outside of the turkey when we roast it. It really does give it that certain something as well as making it look browner than it would otherwise. It looks good! The soy sauce is surprising. Oh! I went to A l’Etoile d’Or, following one of your recommendations. my goodness! That chocolate! And Denise Acabo was just as wonderful and voluble as I hoped she would be. Rubber gloves! So THAT’S why you have such nice hands! This is the kind of comfort food I love! If more people realized how satisfying this is they would stay home and cook instead of going out. This dish nourishes body and soul. In America I find it is best to buy whole chickens and learn to cut them up, the procedure is simple, quick and saves money. I also look for chickens with the lowest amount of added water or use “air chilled” if I can find it. I agree with shallots being a staple, I always keep some but in a pinch a bit of onion and garlic can be used instead. You have really reached me with this post! Yummy, yum, yum! This couldn’t be easier, so no excuses right? Thanks David! So simple, and looks SO tasty! My kind of recipe! :) Thank you for sharing. I could go for a double serving of that right now… perfect food for a hangover that just wont budge! Love the recipe! Thanks! I will try making this dish for my family tonight! You had me at shallots! I am making this soon and linking it on my facebook for my friends to see (returning the favor since you linked one of mine, although my link will probably not have the same effect as you linking mine did). You continue to inspire, David and I agree with the whole cooking/washing dishes argument. I love to cook, I hate the clean up, but I’d gladly don a pair of rubber gloves for the chance to be your guinea piggy! Ah, the humble chicken. It just doesn’t get much better than that!!!! easy and tasty. i mean how hard can that be? i would eat this cold. 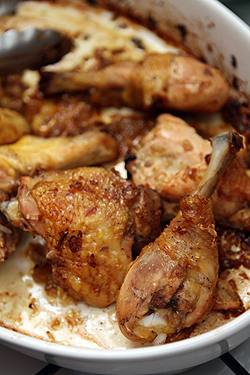 The best part about a roast chicken (after the tender, flavorful meat of course) is the skin. The crispy, yummy skin. Does that sound gross? This looks great, and I just found some lovely shallots at my market a few days ago! I really like the idea of adding a little soy sauce. How would it turn out if I used skinless chicken pieces? I had this beautiful salad at a restaurant (The Magic Pan!) years and years ago with orange segments, almonds and these small, thin, pefect rings of onions[?]. Once I discovered they were shallots, I’ve never used onions or scallions again in a homemade salad or on a sandwich. Shallots are the perfect size and the onion flavor mild enough to use raw. It lead me to use them for many other cooked applications too, though I still use gold old yellow or sweet onions in cooking as well. I don’t always understand the preference for eating out when cooking your own food is not only enjoyable (unless you have whining picky eaters..grrrrr) but you have control over flavorings, amounts, doneness..sides, whatever, and meals don’t really take that long to make yourself. Clean-up? The cook doesn’t do dishes after the meal in our house; Incentive enough. .
David, you have the most wonderful sense of humor! And for a very famous chef — you’re just downright friendly! I love your blog and seeing an update waiting to be read makes my day (well, not really but it makes me happy). Continue the fun and thanks for your blog! David, This looks so easy and so delicious that I’m going to try it out for dinner tonight. I also made my way to Orangette (had never been), then on to Amazon to buy Molly’s book and realized I had purchased your book 3 or 4 times for friends but never for myself. So, of course, when Amazon had Molly’s book paired with yours, I had to buy both! Thanks for such a nice time on this blog. I always come away feeling like I’ve just had tea with you or a glass of wine in a cafe. You must have crazy readers come up to you all the time behaving as if they know you. I would be right there with them. can you recommend any equally delicious and quick fish or veg dinners? Looks and sound wonderful! I’ll have to try this (I have several loads of visitors around Easter. Sounds like a perfect dish to make on that occasion). Well, cooking itself is often not that time-consuming. But if you count having to go gather all the ingredients (and going back out because you forgot something) and doing the dishes, pots and ustensils, it can amount to more time than most people would be willing to put in. I guess when people say they don’t have time to cook, they mean they don’t have time to make elaborate dishes. But, as your beautiful chicken shows, simple can often be tasty. Thank you for another recipe – I’m sure it’s fabulous.. Can you please tell me what “la gazinière” is – I was unable to translate the term French to English. My assumption is the open flame of a gas stove, and I like the idea of doing that. Merci. Roasted chicken is just one of those super-simple, go-to recipes for me. I don’t often cook a whole one, but use pieces instead. About the only thing I do differently is not to flip the chicken over; I just let it bake skin-side up because I adore how crispy the skin gets. A bit of lemon juice in the ‘sauce’ is fantastic, too. If you’re not using soy sauce, a generous application of salt to the skin is quite tasty. And anyone who says they don’t have time to pull of this recipe, or a similar one, just doesn’t know how easy it is. I have to admit I’m with Hazel on that one – I would make that much chicken feed 6-8 people and fill the plate up with lots of fresh vegetables, lightly steamed, and fluffy mashed potato, or just possibly home-cooked chips. But that sounds a wonderful way of cooking chicken pieces, and one I shall definitely try very soon! I’d do your dishes any day! Simple recipes like this one are always the best. Can’t go a week without having some chicken dish. Very similar to the national dish of the Philippines, the Adobo. Your choice of protein, mix equal parts soy sauce, vinegar, water (or less soy sauce/vinegar, more water to soften meat, all to taste), pressed garlic, ground pepper, 1-2 bay leaves, salt (or none), 1-2 tsp sugar; braise until meat is soft; reduce sauce; or may finish meat in oven, caramelize/brown/fry in its rendered fat. Masarap! with lots of white rice and tomatoes. chicken looks great and so easy! seems like anyone would have time to make that! With this dish, I don’t think anyone can use the excuse that they don’t have time to cook…or clean up afterwards. Thanks for the recipe! Made this dish (or a version of it) tonight for a friend and I. Accidentally poured in too much soy sauce but evened it out with more oil an vinegar. It was absolutely fantastic. Thanks very much – that’s dinner tonight all sorted!! Thank-you for giving me dinner for tonight (and many others to come). Timing is EVERYTHING. I was just wondering what to make for dinner. Printed off the recipe, heading to the store, & will be eating this for dinner TONIGHT — YUM!! This looks just delicious! I’ve a fat hen in the fridge and am making this for Sunday dinner. Thanks for the recipe! like guia said, this is very similar to adobo of the philippines, with the addition of garlic. we cook it stove top though and it would be interesting to do this roast version. 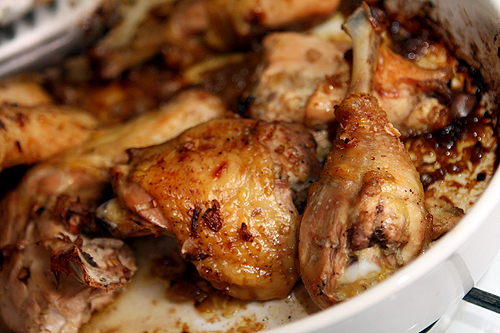 My house still smells like this gorgeous chicken dish…so fast and easy. However, I’m wondering why mine did not look like your dish. There was so much fat in the pan, there wasn’t a chance for anything to caramelize or evaporate. The chicken was moist and perfect but not browned & not caramelized. Oven at 425 in a stoneware baking pan. Suggestions? Half a chicken per person?! Are the chickens tiny in France? The Amish fryers I buy for roasting (as per the suggestion in Judy Rodgers’ book) average about 3 1/2 to 3 3/4 lb each and I get at least 4 servings out of them if not more. Anyway, I love Susan Loomis’s books and am all about shallots and easy recipes, so thanks for this. Damn you, Lebovitz! I was happily on my way to becoming a vegetarian, and now you’ve gone and put me in a fowl mood! You had me adding shallots to the shopping list at ‘there’s hardly any dishes to wash’. Who on earth is that person who commented their husband does 90% of the dishes? Maybe I’ll skip the chicken and just make myself a Sidecar! Someone mentioned doing this on the stovetop. I would love to have directions for that, as I have no oven. And David, those bigger chickens at the Lenoir market and various boucheries (dripping gorgeous fat down upon a drawer of roasting potatoes)… are they actually roosters? I’ve been noticing two different sizes of poultry there, with a big difference in size. Is one better than the other? We’ve bought both, and half a big one seems to be more tender than a whole little one. Thanks for this recipe! If I can’t make it here, it’s going back home to the States with me. SpecialED: You could use skinless chicken, but the chicken would dry out in the oven. If you’re trying to avoid eating chicken skin, I would simply rub the marinade underneath the skin before baking, then just don’t eat the skin afterward. noëlle, Heather, Hazel, mrsredboots: There’s quite a few places in the US where “1/2 roast chicken, with sides” in the standard (bbq, chicken roasters, etc…) I was served this at a taqueria in Texas, and I was served this jumbo serving of fried chicken on a recent trip back to the states. And if memory serves me, I think I ate them all! 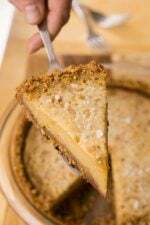 Julia luli: Much depends on what kind of baking dish you use, and the heat of your particular oven. If you have a lot of bottom heat, you can bake it on the lower rack of the oven. As you can see, I used a porcelain baking dish. If you use a metal one, you could run the chicken under the broiler for a minute to brown the chicken. Or brown them before baking in a skillet. Susan: I loved The Magic Pan…especially the crêpe filled with a brick of vanilla ice cream and lots of steaming hot chocolate sauce. I always ordered the chicken mornay crêpe, beforehand, which I thought was so fancy. 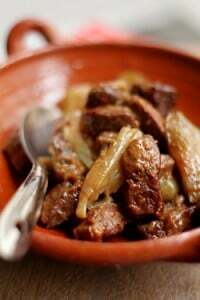 Maya: I don’t know any French restaurants in Paris that cook in clay pots, but many North African places make tagines, which are cooked in clay tagines. Some to check out at Chez Omar (for roasted lamb) and L’Atlas, as well as others. veron: Soy sauce (and Maggi) I think are relatively common, even in French kitchens. I’ve even seen a bottle of ketchup (discreetly) stashed away, since they all add that je ne sais quoi (umami) to things, if used in discreet amounts. Hi David… Great recipe…so simple and delicious… By the way, I’m using your blog to learn French.. Amazing !!! I love simple chicken dishes. This one is especially interesting with the addition of soy sauce in a French dish! I always prefer shallots to onions. The flavors are much nicer with almost a sweetness added to the dish. I’ll have to give this one a try! By the way, people always have to head home for the evening when they see my kitchen after a dinner party…no one ever wants to do the dishes, but they sure enjoy the food! There were shallots and organic chicken pieces at the farmers’ market this morning – guess what we’re having for dinner!!! With mashed potatoes, I think, and some green vegetables. Here, if you go to Nando’s (spicy chicken place – fast food, but VERY nice and no relation at all to those gruesome KFC-alikes) the standard serving is 1/4 chicken. Which I find a lot, but worth it on occasion. This is similar to a Filipino dish called Chicken Adobo, just add equal parts of vinegar, soy sauce and water, add garlic , onion , bay leaf and black pepper to the chicken and let simmer until the chicken is tender, Sometimes I add a little bit of oyster sauce to it. It goes well with rice.Enjoy! Encore, David, I ask you and rephrase the question: doesn’t finishing the chicken skin side down make it soggy? Just made this, house smells great!! I must say that American chickens must have a much higher fat content than French ones; I had to drain it off a couple of times to keep this from being chicken poached in chicken fat and to get the shallots to caramelized. DannyDG: Another reader mentioned something about that, and a lot of Asian dishes add vinegar and soy and let the meat simmer. I love that salty-tart flavor, too. Sounds like something I should try, too. Katie K: Mine didn’t come out soggy, but as mentioned in a previous comment, much depends on variations in ovens and what bakeware is used. I followed Susan’s instructions pretty faithfully, although due to variations, readers and cooks likely know what works best in their own kitchens. For example, my oven has intense bottom heat, so I tend to bake things I want crisp closer to the bottom. bunkycooks: In Paris, it’s hard to get people to leave before 2am. Which is okay, and by then, I just want to be left alone with the dishes anyways…and any leftover wine! Lauren: I try to buy poulet fermier (farm chickens) which are fairly lean. It sometimes means the meat isn’t as tender when roasted–although I suspect a lot of people here braise chicken, whole, which is how it’s usually served when I’m invited to someone’s house for dinner. But I barely had any liquid in the pan on this batch and was actually tempted to add a splash more vinegar this time. PF> yes, la gazinière is the cooking station of most french homes : a stove with 4 gas fires (where you can put a pot to boil the water) and an electric or gas oven below. My mother (and so do I) usually opens one gas fire on high heat, then she presents the chicken or the chicken pieces inside the flames, and she lets the flames totally “lick” the skin. She stops when the skin looks completely dry, it’s a matter of 10 or 20 seconds per piece. Then when she cooks the chicken in the oven the skin is crispy and nicely brown, never soggy or rubber-like :) . emily> I think the french equivalent of this chicken dish but with fish is saithe/pollock* with tomatoes and onions : le lieu noir tomates oignons : Place on a pan some slices of tomatoes and onions, then some beautiful filets de lieu (colin) (saithe) in one layer, then tomatoes and onions again. Add salt and pepper between each layer and finish by little pieces of butter on top, maybe 15 or 20 grammes for the whole. Put in the oven for 30 to 45 minutes depending on the number of fish pieces… serve with more melted butter mixed with fresh herbs such as parsley and some lemon juice or lemon zest, in a side bowl (family style) or in la saucière (when you have guests :D), and you can serve some rice as a side dish. SpecialEd> the same dish with skinless chicken would probably turn the meat to a “sad piece of leather, with shallots sauce”. pretty good if you need to repair your shoes I think, but that’s pretty all you could do with this. I’d gladly come wash your dishes to help recipe tasting! The chicken looks great, we’re sitting on 5 pounds of Chili Verde right now, but I still want to make this tonight! Yes, this dish is almost like the Filipino Chicken/Pork dish except it’s missing a head of smashed or minced garlic, and 1/3 cup of vinegar, 2 Tbsp. or more of soy sauce (apple cider or coconut vinegar is preferred. We usually marinate Adobo overnight for the best flavor then boil it the next day over the stovetop. As a final step, either broil the chicken for 10 mins. to get crispy chicken skin or pan-fry the chicken. The sauce is then reduced separately and served over steamed jasmine rice. Try it! I will try your baked version but will definitely add garlic. Thanks for sharing your recipe! I love the French Farmhouse Cookbook. Are the Brest chickens really as delicious as I’ve heard? If so, I may need to make a special trip. I did mine this afternoon in a 9 x 9 glass Pyrex and cooked 4 thighs instead of a whole chicken. I was unsure about the sauce so I used the exact measurements, opting to err on the side of too much liquid rather than too dry chicken. I’m glad to read I’m not the only one with extra liquid…but I’ll cook some brown rice to go with it. Flavor is magnificent…can’t let that go to waste! By the way, I started mine skin side down and turned it at 20 minutes. Another 20 minutes with the skin side up it wasn’t brown enough for me so I lowered the temperature 25° and turned the “Speed Bake” fan and cooked for another 7 minutes. Perfection! Extra juice yes but oh so tasty. Thanks for sharing! Made this wonderful dish for dinner tonight and it was so much juicier than even my brined, roasted chickens. The husband in particular was a fan of the addition of shallots and even though I too had leftover liquid, I thought it really added to the dish. We just spooned it over roasted root veggies. I can’t wait until April 6! I’m so ready. David, you are fabulous! Thank you for such a fun blog and amazing recipes. Just to let you know this dish is everything you said it would be! Filled the kitchen with an amazing aroma. So incredibly simple to make. Roasted and Caramelized – by far the tastiest two adjectives. in the spirit of not having time to cook I’ve made this dish without having to even cut up those 4 shallots: in Chinese markets you can find fried shallots in a plastic tub and you just shake those puppies onto your chicken and bake away! Thank you so much! I do not know a lot of things about blogging, I tried my best..
Ah! Le Sot l’y laisse . . . there’s a little restaurant near to us. . .just over the line in the 12th named that. I wondered! Thanks for clearing up the mystery. David, I would gladly wash the dishes in return for a meal cooked by you. I’d even do them just for a desert like that banana upside down chocolate chip cake. Oh! Chicken Adobo. In the Philippines there are different ways of cooking Adobo. We sometimes mix chicken, chicken liver & pork and sometimes we use pork belly only. Instead of shallots we use garlic, bay leaf, black pepper, and palm vinegar and the obligatory soy sauce, or if there’s no soy sauce, we use fish sauce. 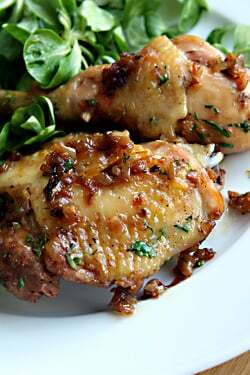 Chicken and caramelized shallots! Looks delicious. Loved the post. I made this last night, inspired by the delicious photo. It was a little nerve-wracking because my husband HATES vinegar, but I was so in love with the idea of caramelized shallots . . . anyway, I chose not to mention the vinegar until he started raving about how good the chicken tasted. He was stunned (and now I might actually be able to toss our salads with a legit vinaigrette instead of olive oil and lemon juice!) This was a perfect Sunday night dinner – can’t wait to make it again. We just had this for dinner. It was sooo delicious! Thanks for sharing the recipe. Ah, les echalottes! Bring them in, anytime! I have never seen/heard of a distinction between fryer vs. roaster vs. ? in France. You mostly get your chicken whole and then ask the volailler to cut it for you if you need to braise/brown it.. but I remember that most chickens we ate were roasted whole. You had me at the caramelized shallots. . . the rest just adds to it! I have never had the soy sauce in the my baked chicken, but I am definately going to give it a try next time I bake chicken in the oven. great recipe, thank you. even i can do this. no sweat. Holy Goodness that looks good! I can almost smell it! I just made this for dinner tonight. It was astounding, the caramelized shallots were ridiculously yummy and the chicken was so moist (despite my removing most of the skin before putting it into the oven). David, your recipes never disappoint. Merci mille fois. I know what you mean about cleaning up – I often decide what to have for dinner based on how many dishes/pans are required to prepare the meal. Pasta is my favorite but too many pans – sauce, pasta, strainer, cheese grater – so its not on the menu often. I made this today. A few things…pan searing before is a must for me. I didnt do it and just followed the recipe exactly and the result was slimey skin and dry cuisse (thigh). I think the chicken released too much of it juices and did not allow the shallots to carmalize in the 40 minutes of cooking time, bummer. Boyfriend still loved it though (and he’s French so that says alot in my books). I will take a do-over on this one, but no doubt about it, it’s a very simple and healthy recette. Thanks again David. Love shallots. Love chicken. Love easy dinners. I will definitely give this a try. I look forward to your posts every day. Made the chicken with shallots last night, loved it. I love the wooden salt and pepper cellar in the photos with the salad dressing. Any chance I might be able to find one like that? Ellie: You’d likely have to go to a lot of flea markets in the French countryside to find one, as that one is a few years old. A reader had a woodworker re-create them and left the details in the comments on that post. But you’re right, that browning meat gives it extra flavor. Angie: I love those shallots, too, which I think are similar to the canned fried onions they sell in American supermarkets. Which oddly, are produced by a company called “French’s”. Although perhaps it’s not so odd because a friend who lives in the south of France brought me a bag from a local producer that were insanely good! I made this last night and the kids loved it. They ate it up. Quick, simply, delicious. I love to find this sort of recipe when I visit your site. I made this for dinner tonight and we LOVED it! Thank you! Thank you! Thank you! David, I made this last night with cornish hens. I left them whole and just flipped them a few times. The flavor is wonderful. I’m planning to try this soon with chicken. Thanks for the great recipe. I made this today and this was pretty good! I added a bit of maple syrup, however, and clearly that was a mistake – talk about not wanting to clean. Some irony here. I am chiseling burned shallots off right now! But I loved the sweet touch and the simplicity of preparation. I did decide that mincing the shallots was not a great idea – next time I’ll chop them coarsely, then they will not burn so much. My home-grown chickens need a much longer time to cook than 40 min (mine took at least an hour and fifteen minutes), so that didn’t help the shallots not to burn. But it’s March in Wisconsin and the sap is running – which means that maple syrup goes on everything. My husband liked this and I am happy to have this added to my repertoire. It was even good with a skinnier 4.5 lb chicken (by our farm standards this is by far too small). Normally, the sad said bird needs some sort of a moist heat method. 1)5.5 to 6.5 free-range homegrown chicken (will work with storebotten too), skin and cavity dried well, sprinkled with a generous amount of salt and a bit of pepper, then trussed and roasted on a rack first at 450 for 20 min, then for 375 for an hour, and 350 for another 40 min till 175 F. No basting. No extra seasoning. No stuffing Nothing. It’s perfection itself – salty, crispy skin, moist pink flesh, reminiscent of smoked chicken, found the recipe online. Then you rip it apart with your hands and devour it on the spot – it’s so, so very good. Falls right apart. Chicken is cut into pieces (back too), drenched in flour, browned in oil while sprinkling with seasoning salt, then placed in a dutch oven or some covered vessel and then baked at 350 for 2 hrs. The gravy is then made with the drippings, flour, water from the boiled potatoes (that are to be mashed), and cream/half’n’half/milk. Everyone’s favorite. Needs a good fat chicken though as well. Life is all about good fat chickens. One more thing David – the best thing about this recipe was the new way to cut up the chicken – now it had never occurred to either me or my husband to keep the wing on the breast half. Spectacular. I love shallots. I will definitely make this dish. Yum. I made this and it came out great. So yummy! Thank you! I love your blog! I learn something new every time I visit! I love cooking with bananas! I think they are under appreciated for the nutritional value they have and ease of cooking. I really like plantains also. I made this for dinner tonight. The chicken was AMAZING! It’s way better than any roasted chicken recipe I’ve ever used. It’s delicious and easy. More than good enough for company. Thanks, David! I made this with chicken tenders (boneless and skinless slivers of chicken breast) and it was moist and delicious. I used tenders because I had just bought some on sale. This was excellent, and so easy. While the chicken was cooking I chopped some romaine and made my favorite lemon garlic dressing from Deborah Madison’s Vegetarian Cooking for Everyone. Add a big fat chunk of chewy paesano loaf for sopping and a glass (or three) of red wine, and you’ve got one spectacular and spectacularly relaxed supper. Thanks! I made this dish this week with skinless, boneless chicken breasts and and the husband and son absolutely devoured it. Really good! What a perfect timing! as I was just looking for a quick main course for Passover Seder next week. To make sure that I’m not risking my reputation, I made it for lunch today and it turned out to be a hit. Given the soy sauce that goes into the dish I should have been more carfuel with the salt. Will fix it next time. BTW,the somewhat salty juices went prefect with potato puree. I made this chicken last night and it was a hit! My 8 year old is so picky about food, but I served it with his favorite (bread and balsamic) and told him the same ‘vinegar’ was on the chicken and he ate it!! He usually only eats my homebaked chicken nuggets! Thank you, thank you, thank you!! I just took this out of the oven and ate a piece of the chicken. Yum, yum, yum! Delicious! Thanks for sharing your recipe. perfect. just bookmarked this for a future meal. Made that recipe for dinner tonight and it was great. I made this for dinner with baked sweet potatoes, steamed asparagus and butterleaf salad. Delicious. Couldn’t have been easier and truly made as few dishes as possible. I loved it. But I like meat on the bones and dark meat. My family prefers white meat and boneless/skinless. For those made it with b/s breasts or tenders, how did you keep it from drying out? Seems like it could be stove top meal if you are working with boneless white meat? I am so in love with shallots I look for excuses to cook them. Tonight was shrimp with shallots, fresh peas. This week, it will be this dish. The soy sauce is a nice touch to bring that hidden zip. I usually do Worcestershire. Thanks for a great recipe. It may be that the tenders stay down to be more covered by the liquid than a bone-in breast would. The cooking time seems to be for the shallots instead of to get the meat done. We cooked it five minutes longer than David called for because the shallots were not yet caramelized and there seemed to be too much liquid left. When we removed them there was still some liquid and the shallots were wonderfully brown. I don’t see any advantage in cooking this on the stove top when using tenders and I see a few disadvantages. I would stir them more which might interfere with the caramelization, and if you had the burner on too high, then the liquid would be driven off before the chicken is fully cooked. It also looses its charm as a no fuss, one dish meal because I don’t serve in stove top pans, but I do in my nice baking dishes. Oh, I used apple cider vinegar and it worked very well. Finally made this for dinner last night. So tasty. I used a champagne vinegar and served the chicken with risotto and a fresh green salad. Needless to say there were no leftovers. I made this last night. It was outstanding! So easy, so flavorful. Going to link to this post today on my blog. I, too, made this recipe this weekend. It was my first time cutting a whole chicken into 8 pieces, and it was strangely satisfying hearing my kitchen shears snap through the bones (does that sound gross?). Anyway, it was an amazing dish (I used tarragon vinegar) and you’re right, I will definitely make sure these ingredients are always on hand. I tried this one and it went over well. But the skin on the chicken didn’t seem to be as crispy as it looks in the photos. I’m wondering if that’s the way it’s supposed to be. Or maybe I could turn it skin side up at the end and give it a blast under the broiler to crisp it up a bit? 7pm, having a look at some of the blogs I like to check out, in the back of my mind wondering what to do with the “blanc de poulet” sitting in my fridge… you saved the day! Wonderful! Wonderful! Wonderful! As a working mom with two young kids, I am always looking for delicious meals that require little hands on time! This one was spectacularly delicous and a hit with the whole family. It has earned a spot in my regular rotation and I am recommending it to family and friends. Thank you for such a wonderful addition to our repertoire!!! I made this for dinner over the weekend. Very good, so quick and easy that this will become one of my staples! 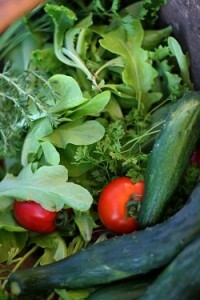 I love recipes that use simple ingredients that I usually have in my pantry. When I make it back to Paris some day, may I come test recipes with you? I’m a great dishwasher. Tried this today. I screwed up a bit by starting the chicken skin side down, plus I didn’t have skin on the chicken breasts. However, all of the pieces still came out tender, the shallots taste amazing, and i feel a bit of spiciness even I think from the pepper/vinegar? Amazed at how little work there was. I just made this dish and it was incredible, thank you so much! It was so simple I don’t even feel as if I made anything, it was less than five minutes prep time and the oven did the rest of the work! Made this the other night and loved it. Just now discovering your blog—thank you for it. I’ll be going on my honeymoon in the South of France (with a little Paris at the end) late this summer, so if you have any specific recommendations, I’d love to hear them! Scotty: I’ve been to the Cote d’Azur and Nice several times, and you can use the search engine to find the specific posts about them, as they include recommendations. Oh my! As soon as I saw the picture, I HAD to have this for dinner. I live alone, so I rarely buy a whole chicken, and as I prefer the thigh & leg meat anyway, this was perfect for the tasty free-range marylands I had in my fridge. So simple. so good. Two thighs, two legs, two meals. This is now my go-to chicken dinner. Merci beaucoup David! Also a great big merci for all the handy info on your blog which helped make my month in Paris last year extra delicious! I’ve tried this three times already. The first time with a whole chicken cut in half. The second and third times using a whole chicken cut into 8 pieces. Yesterday, I added a couple of white mushrooms to the marinade and pureed them using an immersion blender before adding the shallots. I also used tamari instead of shoyu as I’ve done the previous two times. A combination of the tamari and the mushroom definitely added more umami to the chicken. Made this for dinner tonight and it was perfect! Will definitely become a regular in my house. Simple yet very flavorful and moist. With a big green salad, its a perfect meal. Thanks for sharing! David, this was dang tasty. I too had problems with my juices not reducing but it was because my dish was overcrowded. Single layer, yes, but with no space between the pieces. I knew that as I put it in the oven but didn’t have the time to move to a bigger dish. And yet it was still so yummy – can’t wait to try it again and do it right. I’m also starting to make my way through your new book. Racine’s cake (we’re calling it Nibby Cake) was divine. Bookmarked this when first posted and finally made it for Mother’s Day. It was a hit with all the moms, including me. Flavor and ease of prep won me over. Used only legs and thighs and met with success. Like Darla my juices didn’t reduce entirely because of over crowding but everyone loved sopping up the shallots, parsley, and drippings. I like my skin well browned so I turned the meat skin side up for an additional 10 or 15 minutes — looked great, tasted delicious. This will be served again and often. Thanks! I don’t think this was already answered, but I have made this chicken three different times and it’s a HUGE hit! BUT, the first time there weren’t enough shallots, the second time there still weren’t enough and the third time there were too many! Are shallots in France smaller than the ones we find in the US? Please help! Here’s a picture of slicing a shallot in half, which shows the size of shallot that I use. this is delicious; it is now in our regular rotation of recipes. 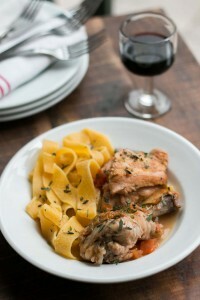 and we just blogged about it: http://su.pr/2PBugC thanks for sharing such an awesome and easy dish! Its sooo easy and delish! I’ve made it 3 times..
I’ve made this 4 times, and think it’s the easiest, tastiest chicken recipe. The last two times I made it with boneless skinless chicken breasts and tenders. I much prefer it on the bone, but my family really only likes white meat. When making it that way, I can do it in a heavy cast iron skillet on the stove top. I start caramelizing the shallots before adding the chicken pieces (cut thin and pounded a bit). It’s pretty good, especially for chicken breast. The family loves it. This is really one great recipe, or technique, that I am so grateful for. Thanks! This recipe was everything I hoped for and more :) I ended up using sherry wine vinegar and hitting the pan with a bit of extra tamari (looked a bit dry when I turned the chicken) and it was absolutely perfect. It’s funny: Growing up my mom always made roasted chicken thighs doused in soy sauce and sliced onions, so this recipe seemed very familiar yet somehow a little more grown up. I’ve forwarded the recipe on to Mom so she can try it. The addition of the vinegar just makes this dish sing. You rock, David! I made this last week and it was awesome. Plus the recipe is super easy. Thanks David! I’ve made this recipe a good number of times with great success this summer. Thank you. Tonight I made it again and decided to add a pinch of brown sugar to the soy sauce, vinegar & oil. Well……..you know……..with the sweetness added in…….it’s awfully good with brown sugar too. Totally naughty (brown sugar) and yummy! Thank you David. This dish is really delicious. It is amazing that just these few ingredients give so much flavor. Can you point me to a couple more of your easy weeknight meals?